Innovative band Stepling has been delighting audiences everywhere with their unique blend of music, step dance, and song inspired by English traditions. 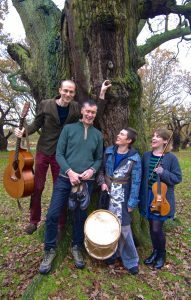 With appearances at venues such as London’s Green Note, Sidmouth Folk Week, Harwich Festival of the Arts, Hitchin Folk Club, Priddy Folk Festival and Bath Folk Festival, Stepling’s dynamic and varied performances have already received much acclaim. Stepling brings together the talents of an experienced group of performers: champion step/clog dancer Toby Bennett (solo dance artist), percussionist Jo May (Against the Grain, Token Women), Deb Chalmers on fiddle and vocals (Folk Dance Remixed, Bella Hardy) and guitarist Adrian Lever (Alma, Horses Brawl) – their performances weave a rich tapestry crossing the boundaries of music and dance.